#2 Benchmark located in Rock at a Nice location. While doing the Cache-O-Lantern geo-art our group came upon this benchmark. Although it does not have its own PID on geocaching I still want to log it as a find. There are at least 3 others that we did not know about within feet of the tower. It is listed on the data sheet for this Knob Reset. Hope others take an interest and find the Reset. BROAD NO 2 1929 is in fine shape on a rock below a large boulder. Out with Team H-D & RWG493 today. Too many rocks to turn over and not enough time. Bagged all the other benchmarks in the area, though. 1st to find this mark. I did put one rock over it so in hope that nobody will see it and damage it. 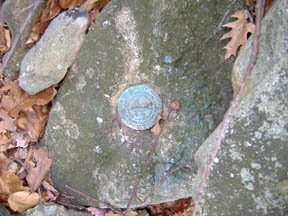 DESCRIBED BY COAST AND GEODETIC SURVEY 1885 (MM) STATION IS LOCATED ON BROAD MOUNTAIN, ABOUT 2 MILES S OF HUDSONDALE, A SMALL STATION ON THE MAHANOY DIVISION OF THE LEHIGH VALLEY RAILROAD, ABOUT 6 MILES NW OF MAUCH CHUNK AND 2 MILES N OF NESQUAHONING. THE PART OF THE MOUNTAIN ON WHICH THE STATION IS LOCATED, IS KNOWN BY THE NAME OF THE KNOB OR BROAD KNOB. IT IS ON THE HIGHEST POINT. STATION IS MARKED BY A BEER BOTTLE BURIED BASE UPWARD ABOUT 2-1/2 FEET BELOW THE SURFACE. OVER THIS IS 3 INCHES OF EARTH AND A PIECE OF BOARD 4-BY 4- BY 1-INCH THICK, OVER THIS IS A FLAT STONE 30 BY 20 BY 3 INCHES IN THE UPPER SURFACE OF WHICH IS DRILLED A 1/2-INCH HOLE AND 1-1/2 INCHES DEEP. THE CENTER OF THE HOLE MARKS THE CENTER OF THE STATION. THE FLAT STONE IS SO FIRMLY EMBEDDED AND WEDGED ABOUT ON ITS SIDES AND TOP WITH ROCK THAT IT WILL NEVER BE NECESSARY TO MOVE IT, IF THE HOLE IN ITS UPPER SURFACE CAN BE FOUND. ON THIS STONE IS SET A MONUMENT 4 FEET LONG WITH ITS TOP ABOUT 6 BY 6 INCHES. ON THE N SIDE OF THE MONUMENT ARE CUT THE LETTERS U.S. AND ON THE S SIDE THE LETTER K, ON THE TOP OF THE MONUMENT CROSS LINES ARE CUT, THE INTERSECTION OF WHICH ALSO MARKS THE CENTER OF STATION. A MOUND OF EARTH AND STONES IS BUILT UP AROUND THE MONUMENT. A CAIRN OF STONES 6 FEET IN DIAMETER AT BASE AND NEARLY 4 FEET HIGH IS BUILT 55 FEET NORTHWARD OF STATION. FROM THIS CAIRN STATION BEARS S 13 DEGREES E. IN CENTER OF CAIRN IS A POST WHOSE CENTER IS 55 FEET 1 INCH FROM STATION. THE TREE USED AS A SIGNAL BY PROF. HAUPT IN 1880 BEARS N 15 DEGREES W FROM STATION, DISTANCE FROM STATION TO N SIDE OF TREE IS 97 FEET 9 INCHES. TREE IS 5 FEET 4 INCHES IN CIRCUMFERENCE. WAS CUT IN JULY 1885. OVER THE STATION IS A TRIPOD AND SCAFFOLD ABOUT 25 FEET HIGH. STATION IS BEST REACHED BY WAY OF THE LEHIGH VALLEY RAILROAD TO HUDSONDALE. FROM DEPOT TO VICTORS IS 1/8 MILE. FROM VICTORS TO TOP OF BROAD MOUNTAIN IS ABOUT 2 MILES. FROM TOP FOLLOW TO RIGHT AN OLD WOOD ROAD FOR ABOUT 1/4 MILE. THEN A PATH IS CUT THROUGH THE BUSHES FOR ABOUT 3/4 MILE WHICH LEADS DIRECTLY TO THE STATION. RECOVERY NOTE BY COAST AND GEODETIC SURVEY 1929 (CMT) STATION WAS SEARCHED FOR BUT COULD NOT BE FOUND. SEARCH WAS MADE ON THE SAME HILL ON WHICH THE NEW STATION BROAD IS LOCATED, A SYSTEMATIC SEARCH HAVING BEEN MADE BUT THE OLD STATION COULD NOT BE RECOVERED. 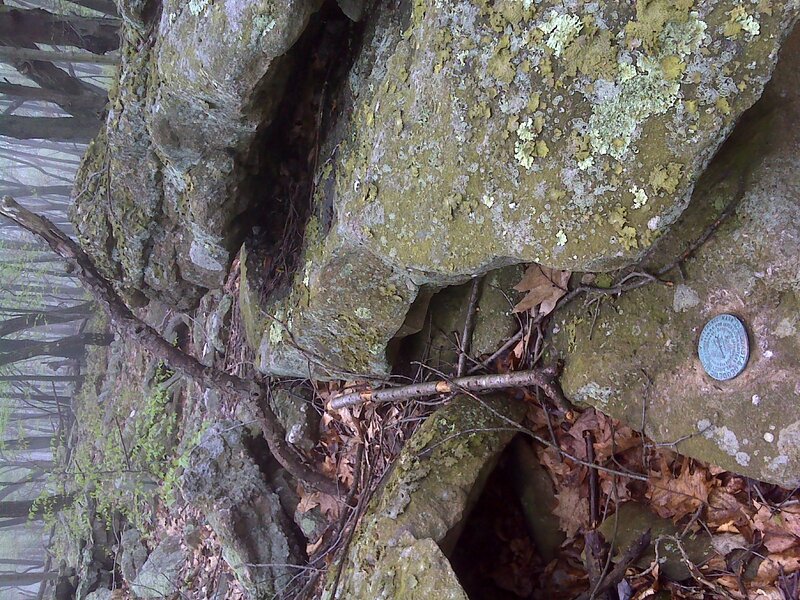 HOWEVER, THERE IS A POSSIBILITY THAT IT STILL EXISTS, BEING HIDDEN BY THE BRUSH, AND A FURTHER AND MORE DETAILED SEARCH MAY BE SUCCESSFULLY MADE FOR THIS STATION. NEW STATION BROAD WAS ESTABLISHED. 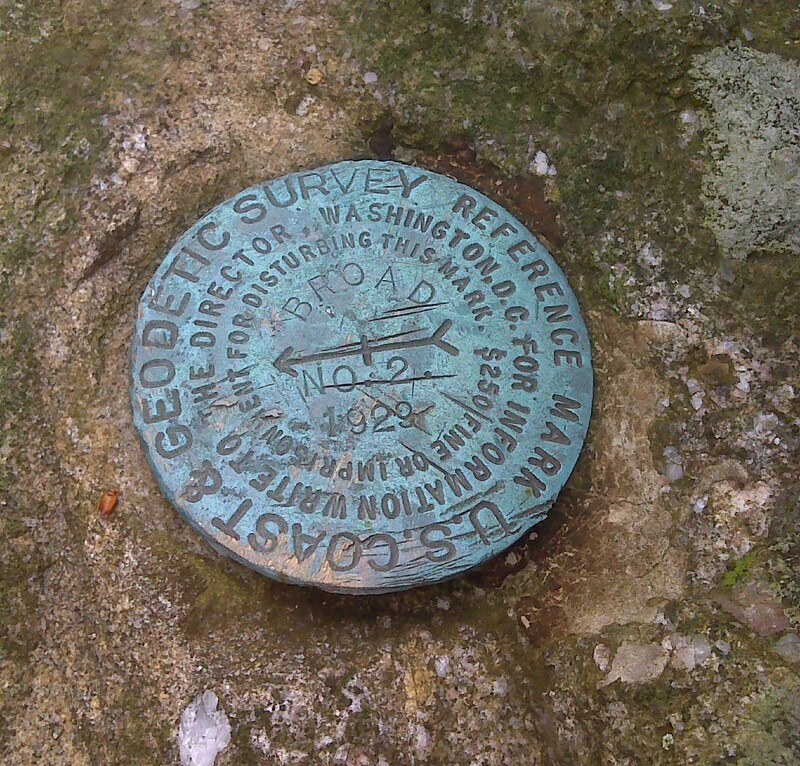 RECOVERY NOTE BY COAST AND GEODETIC SURVEY 1969 (WMJ) THE SURFACE MARK WAS NOT RECOVERED. THE BEER BOTTLE USED FOR THE UNDERGROUND MARK WAS RECOVERED BY INVERSE WAS FOUND IN GOOD CONDITION. THE BOTTLE WAS REMOVED AND A NEW SURFACE MARK AND UNDERGROUND MARK WAS SET, HOLDING THE EXACT POSITION. TRIANGULATION STATION BROAD 1929, REFERENCE MARKS 2 AND 3 WERE USED AS REFERENCE MARKS FOR THIS STATION. THE IMMEDIATE AREA HAS BEEN CLEARED FOR A NEW LOOKOUT TOWER. A NEW DESCRIPTION FOLLOWS. THE STATION IS 7 MILES NORTHWEST OF LEHIGHTON, 3/4 MILE WEST OF STATE HIGHWAY 93, ON THE SUMMIT OF BROAD MOUNTAIN, AT THE SITE OF THE BROAD MOUNTAIN LOOKOUT TOWER. TO REACH THE STATION FROM THE NESQUEHONING POST OFFICE, GO EAST ON U.S. HIGHWAY 209 FOR 1.5 MILES TO STATE HIGHWAY 93 ON THE LEFT. TURN LEFT AND GO NORTHWEST ON HIGHWAY 93 FOR 3.4 MILES TO A ROAD LEFT AND SIGN BROAD MTN FOREST FIRE TOWER. TURN LEFT AND GO NORTHWEST, THEN WEST ON A DIRT ROAD FOR 0.8 MILE TO A ROAD LEFT. TURN LEFT AND GO SOUTH ON A DIRT ROAD FOR 0.2 MILE TO THE TOWER AND THE STATION IN THE ROAD ON THE WEST SIDE OF THE TOWER. THE STATION IS A STANDARD TRIANGULATION DISK STAMPED KNOB 1885 1929 SET IN THE TOP OF A SQUARE CONCRETE POST WHICH IS FLUSH WITH THE GROUND. IT IS 30.5 FEET WEST OF THE SOUTH LEG AND 18.5 FEET SOUTHWEST OF THE WEST LEG OF THE TOWER, 19.8 FEET SOUTH OF A 16 INCH TRIANGULAR BLAZED TREE IN THE MIDDLE OF THE ROAD AND 7.0 FEET EAST OF A 12 INCH TREE IN THE CLEARING. TRIANGULATION STATION BROAD 1929 IS A STANDARD TRIANGULATION DISK STAMPED BROAD 1929, SET IN THE TOP OF A CONCRETE POST WHICH IS ABOUT 8 INCHES UNDERGROUND. IT IS 10.0 FEET NORTHEAST OF THE SOUTH LEG AND 8.7 FEET SOUTHWEST OF THE EAST LEG OF THE TOWER, AND 6.7 FEET SOUTH-SOUTHEAST OF THE SOUTHWEST END OF THE TOWER STEPS. REFERENCE MARK 2 IS A STANDARD REFERENCE DISK STAMPED BROAD NO 2 1929, CEMENTED FLUSH IN A DRILL HOLE IN A BOULDER WHICH PROJECTS 1 FOOT ABOVE GROUND, BUT ABOUT 2 FEET BELOW SURROUNDING BOULDERS. IT IS 69.5 FEET SOUTH-SOUTHEAST OF THE SOUTH LEG OF THE TOWER, AND 16.5 FEET NORTHWEST OF A 18 INCH TRIANGULAR BLAZED TREE. 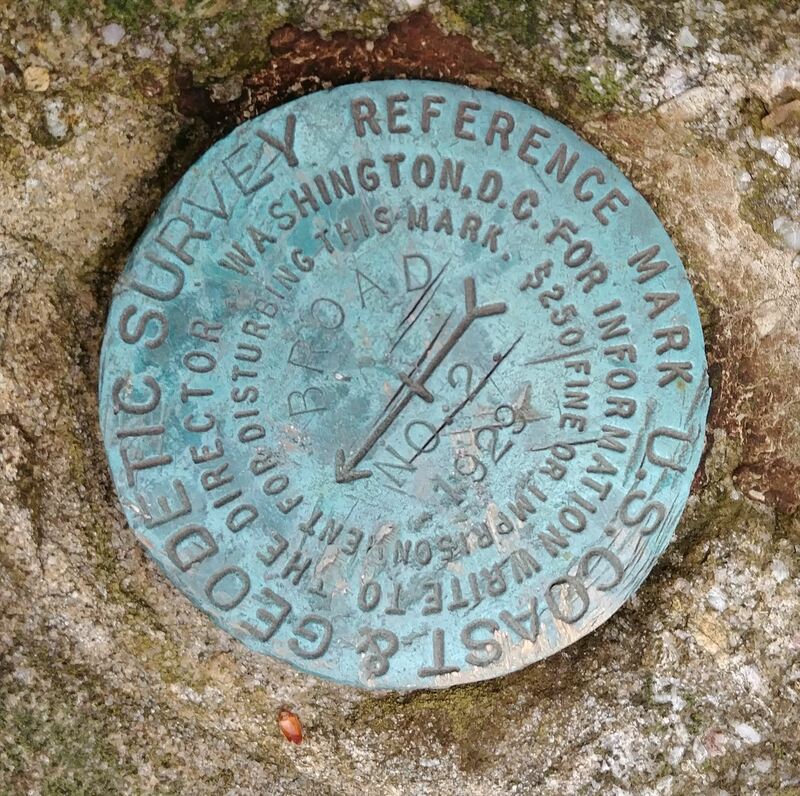 REFERENCE MARK 3 IS A STANDARD REFERENCE DISK STAMPED BROAD 1929 NO 3 1969, SET IN THE TOP OF A SQUARE CONCRETE POST WHICH PROJECTS 2 INCHES ABOVE GROUND. IT IS 49.5 FEET SOUTH-SOUTHWEST OF THE SOUTH LEG OF THE TOWER, 8.5 FEET WEST- SOUTHWEST OF A 14 INCH TRIANGULAR BLAZED TREE AND 5.7 FEET WEST-SOUTHWEST OF A METAL WITNESS POST. THE ARROW ON THE DISK POINTS TO THE CENTER OF THE TOWER, RATHER THAN BROAD 1929. NO AZIMUTH MARK TO THIS STATION BECAUSE OF DENSE WOODS. AIRLINE DISTANCE AND DIRECTION FROM NEAREST TOWN- 2-1/2 MILES NORTH OF NESQUEHONING.